The following originally appeared on 8/27/08 at Exit 51. It would seem illogical to crank up the oven in the middle of summer. But the application of intense heat can transform simple summer staples into oven roasted nirvana. Got a bumper crop of tomatoes? Tired of gazapcho? Break out the sheet pan and turn the oven on. In one afternoon, you can work some magic of your own. The oven does all the hard work, leaving you free to spend a few hours doing something you REALLY enjoy, not standing in front of a hot box. And really, isn’t that delicious? Heat oven to 425 degrees. Line a baking sheet with parchment. 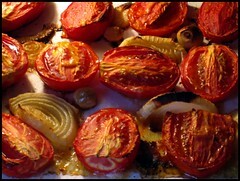 Place onions and tomatoes (cut side up) on baking sheet. Be sure not to crowd them on. You want them to roast not steam. Use a second pan if needed. Drizzle cut tomatoes and onion with olive oil and season with kosher salt. Roast until the tomatoes sink into themselves. Start checking after 40 minutes. If they start to sink but also start to scorch, turn the heat off and let them sit in the oven with the door closed for about an hour. Remove from oven and place in food processor. Add one half cup vegetable broth and process until smooth. Transfer mixture to medium sauce pan set over medium heat. Meanwhile, place two roasted red peppers (discard liquid if using jarred peppers) in food processor and pulse till smooth. Add red peppers to saucepan and stir to combine. Add additional vegetable broth to reach a consistency you like. Season to taste with paprika and balsamic vinegar. Enjoy for lunch, dinner, or a quick snack.